3.5 POUNDS OCTOPUS LEGS; SERVES 8-10 AS AN APPETIZER. Thaw* product on a dish in the refrigerator. THIS PRODUCT IS PRE-COOKED AND CAN BE SERVED COLD OR HEATED... For the octopus, place the octopus into a cryovak bag, add the butter, rosemary & raspberry vinegar and seal in a cryovak machine, removing the air. 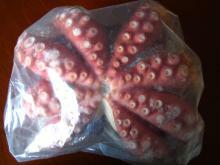 Place the octopus into a preheated water bath @ 70 degrees Celsius for 6 hours. Heat 1 tablespoon of oil in a large frying pan over high heat. Add the fish and cook for 1-2 minutes or until lightly browned. Transfer to a plate and season with salt and pepper. Repeat with the octopus, reheating the pan between batches.... I don't know how pre-frozen octopus would taste raw, though... I would probably go with slicing the tentacles and body into rings (laterally), breading them and deep frying. The speed of frying allows the octopus to cook quickly and avoid becoming rubbery. Then serve it up hot with an aioli, like the Italians. Now, cut away the beak (the mouth) of the octopus. The beak is between the arms. You have to remove it completely, so first push it out a little bit. The beak is between the arms. You have to remove it completely, so first push it out a little bit. Remove from heat and allow octopus to cool in liquid. Meanwhile, place potatoes in a large pan of salted water over medium heat. Bring to the boil and cook for 10 minutes or until just tender.